A wave of strikes culminating on Thursdays pan-worker mobilisation has been the response to the scaremongering of the government amidst the worsening economic crisis that threatens Greece with bankruptcy. After the week of riots came the week of strikes: the multifold strikes that are taking place since Tuesday 15 December and peaked on Thursday 17 with the pan-workers strike called by PAME, the Communist Party Union Front, as wells a dozens of extra-parliamentary parties of the left and first-grade unions forming demos in 58 cities and towns around Greece. The strikes come at a critical time for the greek economy which saw a second degrading in ten days in terms of its credit, this time by the Standard & Poor’s group. The second degrading came as international finance centres claimed the austerity measures announced by the belleagured government are not likely to produce adequate results. 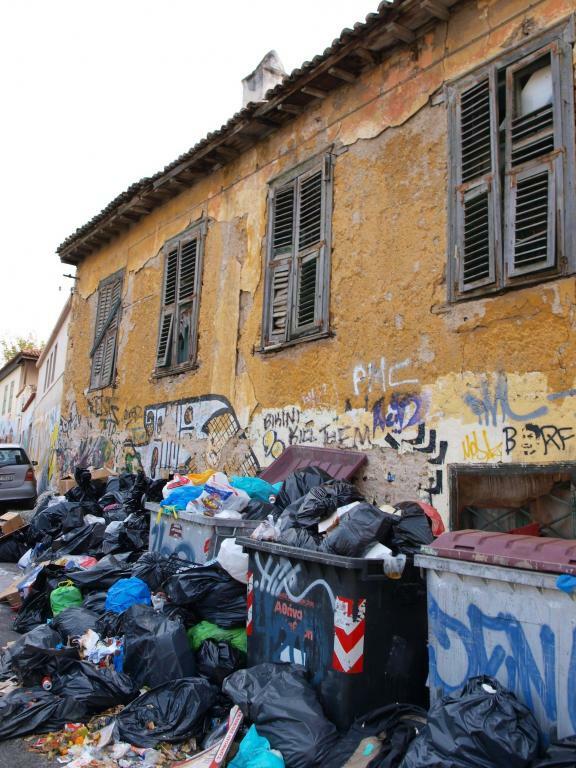 Whereas the garbage collecting strike has been judged for a second time illegal forcing refuse collectors to the streets, large parts of Athens remain plunged in enormous piles of gargabe as refuse workers at the main open refuse dump of the capital have responded to the ban of the previous strike by blockading the gates of the depot, halting 80% of collecting activities. The workers are demanding a reversal of 200 layoffs. The Centres of Citizen Assistance (KEP), the jewel of efficiency in the greek state’s crown, remain closed for a second day as workers are striking. This in effect freezes all private-public transaction as the KEP are the offices that issues official papers needed for any paperwork. The workers are demanding more working positions and a recognition of their previous job experience. Kindergarten and Primary school teachers have been on strike since the 16/12. The teachers formed a demo outside the Ministry of Education demanding 1400E minimum wage, no hour-work schedules, and 2 years free and obligatory kindergarten education for all children. The union has refused to engage on “tabula rasa” dialogue with the ministry. The general union of teachers of all grades joined the strike on Thursday. Taxi drivers have gone on strike in Athens after one of their colleagues was arrested for carrying two sans-papier immigrants. The taxi drivers are demanding the abolition of the law that demands taxi drivers to ask for papers from immigrants that ride on their vehicles, and the immediate release of their colleague. All hospital doctors across the country have gone on strike on Thursday and all intensive care units remain closed. In Peiraeus, talks were concluded on Tuesday regarding the leasing of the Second Pier of Peiraeus to COSCO which was agreed on a bases of 69 million euros collective compensation to the workers, an amount that has created a storm of political accusations by the opposition. Nevertheless the Mechanics Union of the Merchant Fleet has gone on a “warning strike” on Thursday demanding a minimum 1400E salary. All media have gone on a 24h strike until Friday morning demanding the end of the “hostage status” of contract workers, free information sharing emancipated from commodification, and the abolition of all laws infringing social security. As a result there are no news broadcasts on radio TV or the internet. Moreover workers of ERT3 the Salonica based state channel are accusing their directors of going against union decisions and sharing riot footage with the police. A protest march took to the streets of Ioannina on the 16 of December protesting against the invasion of police forces in the social centre of the city during the days commemorating Alexandros Grigoropoulos assassination. In Chania the immigrants social centre and a house of a comrade came under arson attack by neonazis who painted swastikas on the walls of the social centre. There were no human injuries and minimal damage on both buildings. The attack comes as an escalation of parastate violence in the Cretan city, after warnings (or threats) by the minister of public order that left and anarchist violence will result in extreme-right terror attacks. A protest march has been called by greens, immigrant groups, anarchists, left wing parties, animal rights groups and the local teacher’s union for Thursday night against parastate-fascist terror. In Athens, an effort by the extreme-right parliamentary party LAOS to set up a racist local committee with the purpose to purge African immigrants from Amerikis Square was countered when triple the number of antiracists and antifascists responded to the call. The MP of LASO has to take refuge amidst heckling and the attempts to revamp the vigilante plans that have been degenerating in the nearby Agios PAnteleimonas square since the end of the summer were temporarily at least contained. In Salonica, an initiative of lawyers has sued the government for police arbitrariness on the 6th and 7th of December: illegal preventive arrests, illegal fingerprinting and breaching of the university asylum. A member of the directorate of the lawyers association of Salonica has declared that all sueing lawyers have been eyewitnesses to the police illegal actions which are in breach of the constitution that forbids the outlawing or inhibition of protest marches and demos. No permit is needed in greece to form a demo or a protest march. Fingerprinting of detainees is allowed according to a law of the junta and is more and more resisted by protesters. The border tolls of Euzone in Kilkis remain close due to blockades by farmers demanding the immediate payment of a compensation for the 2007 drought. On the morning of Thursday the greek police was once again shamed by the suicide attempt of the legal council to the minister of public order who jumped from the 7th floor of the ministry. Mr Diotis is the son of the notorious district attorney who was responsible for chemically torturing Savas Xiros, the first arrested member of the guerrilla group 17 November, in the intensive care of Evangelismos hospital in 2002. The man is struggling for his life in hospital, his fall being impeded by a row of trees. Moreover the credibility of the greek police has been once again shaken by a poll that revealed than almost 60% of officers consider quitting their jobs if they have to wear insignia with their number or name while on duty, as recently announced by the ministry. Obviously the cops are not willing not to be able brutalize citizens with impunity. Update: Strikers have occipied the broadcasting headquarters of ERT3, the Salonica state channel. The media strikers interrupted the news broadcast of the scabs reading an announcement condemning breaking the strike. ERT3 is the only national channel that has broken the strike broadcasting news bulletins. Other strikers simultaneously occupied the Salonica editors association officers of the city for not participating in the strike. Yesterday members of PAME the Communist union umbrella had symbolically occupied the ministry of economics blocking the minister's office, dropping a huge banner on the front of the building. Also last night radicals attacked a series of banks in the centre of Kavala in Thrace, smashing their fronts and torching them with molotov cocktails. 18 suspects were later detained but released. It must be noted that the strikes are against the will of the PASOK controlled greek CGT. exiting news. If that is not at least the beggining of what Rosa named as Mass Strike then what is it? 2nd update: The workers march in Iraklio, Crete was concluded with a blockade of the medical centre of the city due to nine people being sacked in the past month. In Athens contract workers for the county of Attiki occupied the municipal headquarters in Sygrou avenue protesting against the sacking of 300 co-workers at the end of November. Also thugs attacked strikers at a construction site of the National Electricity Company today inflicting serious injuries to 3 workers who have been hospitalised. The construction sector unionism is predominantly and historically Communist Party controlled. 3rd Update: On aftermath of the great strike, on Friday morning stage workers demanding equal treatment by the government's labour scheme occupied the Ministry of Labour blocking all ministerial operations. Stage workers have also symbolically occupied the municipal headquarters of Serres in northern greece. At the same time workers of Caberos transport company, a branch of a tycoon construction company, in Athens have started an open end strike demanding a clear setting of the date in the month for salary payment and improvement of health conditions and imediate payment of all salaries owed to employees. Meanwhile a barrage of arson attacks was realised between 1:30 and 2:00 in the early hours of Friday against offices of the ruling socialist party across Athens. Do you think that the occupations by schoolkids, university students and anarchists has helped encourage things like the media workers occupation? Are there any pictures of these events anywhere? Occupations, sometimes symbolic other times more permanent, of factories, schools, universities and government buildings has been a long struggle tradition in greece. During Friday unionists also moved to a temporary occupation of the social security bureau (IKA) in the centre of Athens protesting against the anti-worker crisis measures proposed by the government. The occupation of TV and radio channels however is a development directly introduced by the anarchists and emulated for the first time by other protesters.For footage look at http://www.tvxs.gr/v28558 (at the 5:00 minute of the video the occupiers start broadcasting their communique). "The minister says we are exercising violence, but the worse kind of violence is being exercised by the government. When we are years now without social security, not being able to cover our basic needs while the state is fooling us about the funding of our salaries. When we are losing our jobs just before are we not the victoms of state violence?" adding that "its the workers not the unions who are struggling for their rights". Meanwhile the refuse collecting workers of Peiraeus have called a 48h strike and have announced rolling 24h strikes starting on Monday, demanding a reversal of administrative reforms in the municipality that are jeopardising skilled workers positions. hi, just so you know this was the most popular article on libcom in 2009 - and by quite a long way as well, and it was only up for a few days before the end of the year! Then the article was copied and referred to on lots of other websites and blogs. So please do continue to post links to libcom articles on social bookmarking and networking sites everyone!